Pretty Pink Posh Watercolour Blog Hop! Hello and welcome to Pretty Pink Posh Watercolor Blog Hop! Yay! 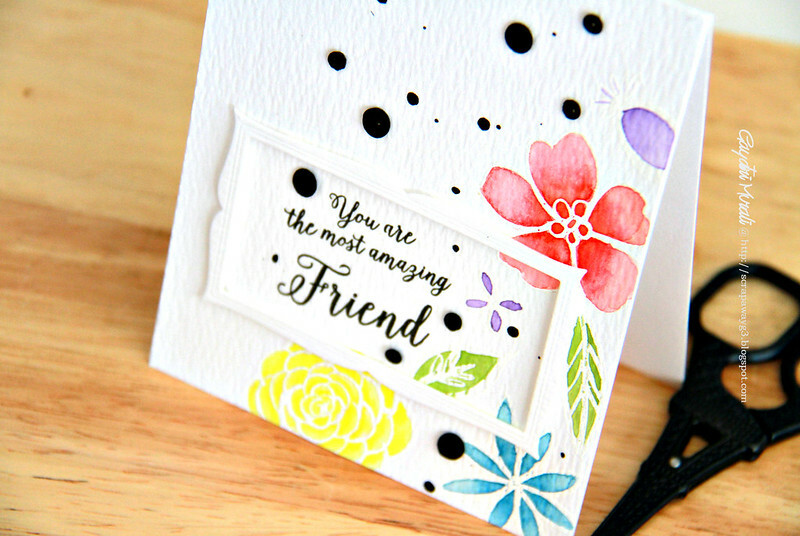 Watercolouring is currently a massive trend with the cardmakers. So this hop is going to great fun and also a great resource for watercoloured cards. I have three projects for the blog hop. Here is my first card. I have used Addie’s garden stamp set from Winnie & Walter to stamp and white heat embossed on watercolour card stock. Then I have used the Zig Real Brush watercolour pens to colour the images and the background. Once dry, I die cut the stitched rectangle panel from Pretty Pink Posh Stitched duo 2 die set. I also die cut three more of the rectangles using scrap cardstock. All the rectangle die cuts were stacked and glued with the watercoloured rectangle die cut on the top. I adhered the watercoloured rectangle frame on the card front using foam adhesives. Then inlaid the stacked stitched rectangle panel back in its place. I then stamped the sentiment from The Party stamp set also from Winnie & Walter. Then the gorgeous Sparkly Clear sequins accented and pulled the card together. Here is a closeup! Here is second card for the hop. On this card, I have used Bohemian Garden stamp set from Essential By Ellen which I have stamped and white heat embossed on watercolour card. The flwers and leaves are watercoloured using Zig Gansai Tambi Watercolour. I then spattered some black Mr. Huey on the panel. The frame is from Taylored Expression called Frame in a Frame die set which is adhered using foam adhesive for some dimension. The sentiment is from Amazing Women stamp set from Essential By Ellen. Finally accented with Pretty Pink Posh’s Onyx sequins. Here is a closeup! And finally the last card for the hop. I stamped and watercoloured to create my own pattern paper. 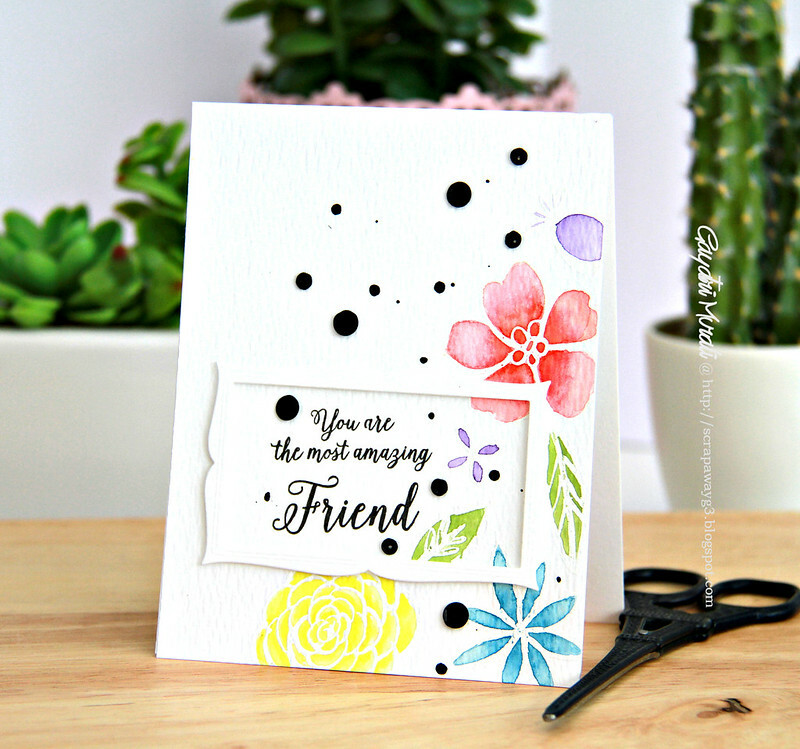 The stamp sets I used are from Simon Says Stamp’s Friendly Flowers stamp set and Wplus9’s Fresh Cut Florals. I inked them with distress inks, misted with water and stamped on the watercolour paper. That gave a lovely watercolour look but I wanted the edges to wash out and not be perfect. So I sprayed the entire stamped panel with water to get the colours to bleed and soften the edges of the images. I used Mama Elephant dies to die cut the scallop panel. The panel looks so pretty but very bold. I then die cut a vellum panel using the same Mama Elephant die set to layer over the panel. Then sentiment is stamped on the Stitched Banner Duo die die cut using white cardstock which is layered on the vellum. The sentiment is from Strictly Sentiment 5 stamp set from Wplus9. Finally accented with Orchid, Lime Sorbet and Amethyst sequins from Pretty Pink Posh. Here is a closeup! Now, there is no blog hop without some fabulous and generous sponsors. Here are the sponsors sponsoring the blog hop. A big thank you to all our generous sponsors. The blog hop officially opens June 5th 6 am and ends at June 8th 11.55pm PST. You can add your entries to Pretty Pink Posh Blog after June 5th 6 am. We like to see you all participate in the blog hop. The more the merrier. We have so many fabulous prizes. In addition, if we can get 100 entries, Paulina will donate a $20 gift certificate to Ellen Hutson or Simon Says Stamp. 200 entries? She’ll donate another! For every 100 entries (up to 500) there will be an extra $20 gift certificate! How cool and mega generous is that? Love you Paulina! So what are you waiting for. Watercolour your projects and link up your entries. These are beautiful. Your coloring is perfect! I jumped on the Zig Clean Color bandwagon and expected to color as well as this right off the bat, of course – but that wasn't exactly what happened. I need lots more practice. Lots. Wow……all three cards are very very beautiful…so soft n elegant look they hv …love the beautiful watercoloring on the cards !! The first card is simply stunning. OMG those cards are breathtaking! Especially the first one makes me want to touch it and look at it in real life immediately. I don't even know where to begin – all of your cards are FAB-U-LOUS! I mean, seriously, CRAZY good! They are all .. well …AMAZING. The firs one with such great colors took my breath away. Love the colors on that first one! Beautifully done. Wow! You went crazy creating for this new hop! You had a ton of fun! What an amazing trio of cards! There are going to be some happy birthday folk and friends! Thank you for taking the time for us hoppers! Wow simply gorgeous! All three cards are painted beautifully! Love all your beautiful cards, the vibrant colors from watercolor are stunning! I like that you used different ways to watercolor, thanks. Your cards are just beautiful. I especially like the layering on the first one. These are absolutely gorgeous! I love them all, but the first one really catches my eye! Amazing cards! I wish my watercoloring was as good as yours. What a wonderful assortment of beautiful cards! The first one is my fave with the stamping on two different layers. Wow you really were busy painting…really love the first with the raised panel and embossing. Beautiful cards. Love the Addie's garden stamp card! Gorgeous! Beautiful cards with lots of inspiration and great water coloring. Thank you! I love, love, love everything about the second card! Gorgeous colors and fantastic layout! Gorgeous cards! I love the first one especially, with its fun layering and colors. Wow. They're all fantastic! Love the popped up center square — nice touch of texture. Beautiful card samples. Great inspiration! All three cards are absolutely gorgeous but I must say that the first one is completely stunning. It is such and inspiration and I think I might have to CASE it during the blog hop. Thank you for the inspiration. I love how you can make the cards soft yet vibrant at the same time. Very clever! Gorgeous cards! Love the flowers and colors, super pretty! These are super gorgeous cards! Love the colors and the different techniques, stunning! OMGeeee fabulous card – love the inlaid die cut. 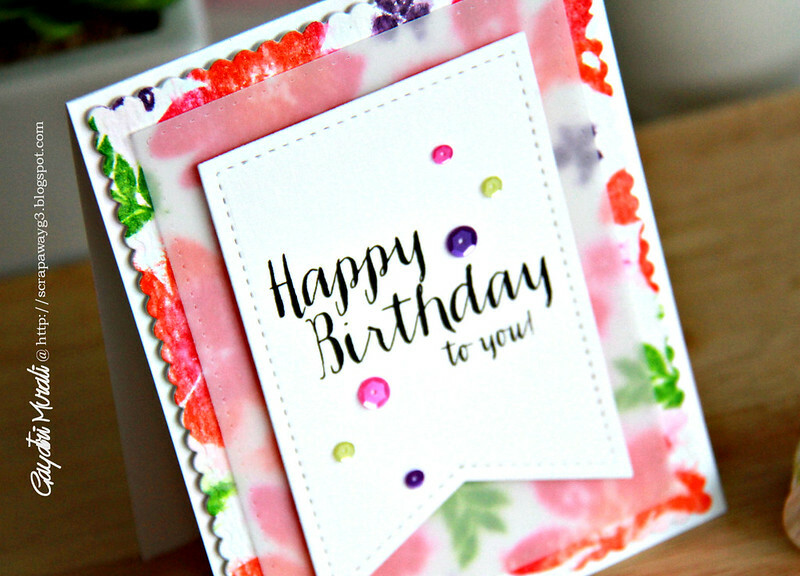 Love the layering and bright colors of your cards. Amazing job! All 3 of your cards are absolutely gorgeous! I'm already a fan of yours, so I wasn't surprised. Nice watercoloring techniques and use of sequins. WOW! I am speechless..They are ALL Beautiful! The colors are so perfect. Gayatri, I loved seeing all your cards. They are fantastic. You were busy! I've been seeing so much about the Zig watercolor markers… this has to be one of the best cards I've seen done with them. Love the more vibrant watercolor look you achieved! Beautiful cards, think the first one is my favorite. Your watercoloring is great. This is just so pretty! I'm amazed at how you can do this! Very nice work! Gorgeous cards. I especially like the first one. Definitely going to try that. Thanks for the inspiration. Wow! I love all of your cards! Your watercoloring is beautiful! Wow… your cards are amazing. I love them all. All three are just so pretty! Love them all! They're all beautiful, but I LOVE the first card! Just love all your Cards!!!!!! The blue background on your first card really makes the images pop! All three are wonderful! I can't believe how vibrant the colors are of those Zig brush pens. Have to get me some. Love your cards and water coloring. All your cards are so pretty!! Love it. I have to go check those Zig real brushes out soon. Wow! I'm always a fan of your work and these are just stunners! Your cards are stunning. Just love them. Omygosh, your cards are absolutely stunning!!!! So gorgeous! Love the way you've framed and stacked them all. Stunning. Gosh these are gorgeous. Hard pressed to pick a favourite but the first one is simply stunning. Wow. I especially love the water coloring on your first card, with the blue around all the flowers. These are absolutely lovely cards you created ! Hats off to you lady! Lovely and absolutely gorgeous cards! I love the layering in the cards!! Absolutely BEAUTIFUL! 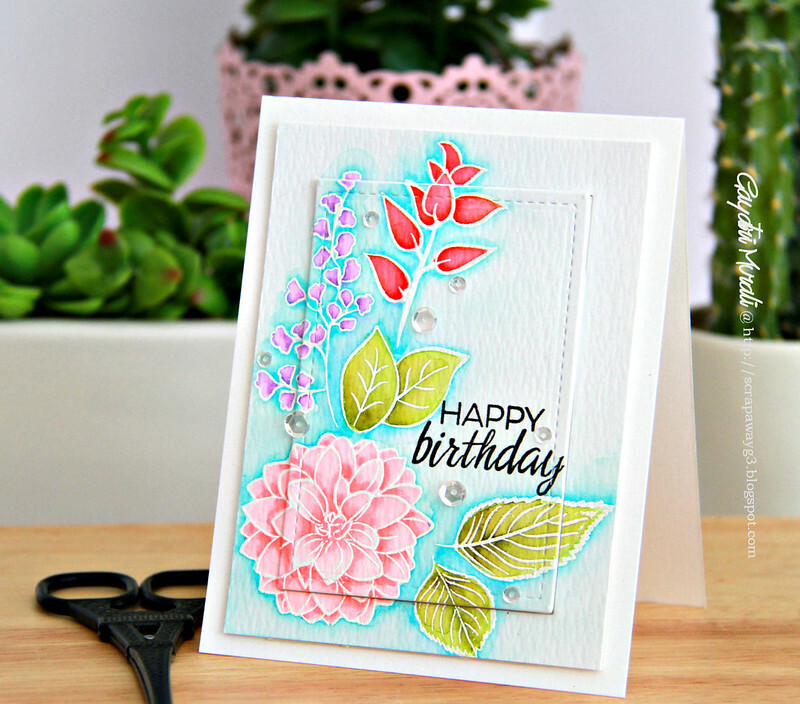 Love your gorgeous coloring – and how vibrant and happy your card is! Hard to choose a fave, they are all gorgeous! Now that is some very vibrant water color.. I love those pens!! Thank you for sharing. Love your use of layering, and those zig pens are definitely on my 'must have' list! Wonderful cards, thanks for sharing! What stunning samples to inspire Gayatri. Very impressive. All 3 cards are awesome Gayathri.. love your style!! love the first card!! gorgeous cards, love the inlaid one, amazing coloring. All three of your cards are beautiful. I love your watercoloring on the first card!! Stunning cards! The white embossing looks great on these. I love the pop of the flowers on the blue background and the way you raised the center panel on the first. Just beautiful. I love how soft it makes the flowers look. Very pretty! I like the vellum over the background piece. Such lovely and beautiful watercolored cards!! Beautiful cards! I just got my Zig markers & am loving them. I need to try the heat emboss next! the first card, so exquisite! Holy shazam! This trio of cards have my breathless!! All three are spectacular but my favorite is the first one! The colors are scrumptious and I love how you did the stamping!! Magnifico! TFS! Love the cards! I especially like the Walter and Winnie stamp set. Thank you for sharing! How fun is these card!!! Gorgeous colors, gorgeous cards! I am inspired to use my Zig pens now! And of course all of my PPP dies and embellies! Thank you! OMGsh! Your cards are fabulous, I love each and every one! The dimension on your first card is fantastic! All of your cards are beautiful Gayatri! I couldn't pick a favorite since they are all so pretty! Beautiful cards. Love the watercoloring. Thanks for sharing. They are ALL simply stunning! wow! These are all beautifully done! so far…your card is my favourite, cant wait to try the popped up technique. All three of your cards are amazing. Lush colors beautiful designs. All of your projects are stunning! Your watercoloring is seriously gorgeous!! Gorgeous cards! The watercolored images really pop against the white and are so very lovely! TFS! All three are stunning cards! Too hard to pick a favorite. Your coloring is superb no matter what medium you use. Awesome work! I am always amazed when people can line up those raised panel cards so perfectly. When I try, it looks like something out of a Picasso painting, except not worth as much money. Gorgeous makes!! Hi Gayatri. All 3 of these are so pretty. My favorite is the first one. I just got that set and will have to give it a try. Beautiful cards! I am inspired by your talent. Thank you for sharing! Wow!! Gorgeous cards!! Love your coloring! These are simply beautiful! Love all the watercolor that is happening! Wow, Gayatri! These cards are just gorgeous! love the bright colors, good job! I just found your blog and your cards are exquisite. Beautiful! Really like the first card you showed. I like the contrast between the bright and muted colors, and the inlaid die cutting. Wonderful! All three are stunning! I can't even pick a favorite! Love all of them. 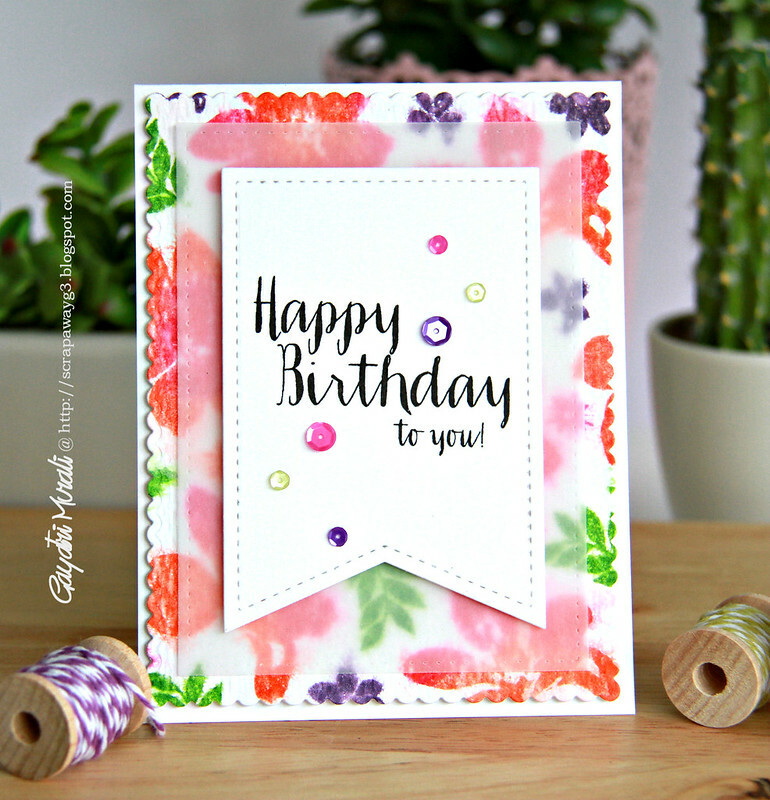 Gorgeous colors–love all the textures you've used–the vellum is yummy! All your cards are gorgeous! The first one is my favorite. Love how you outlined in blue and die cut/popped up the center! They're all fab, but I love, love, LOVE the first one!!! The colors and the blue outline…. exquisite! All three of your cards are awesome! The first one really catches my eye! Beautiful! I like the vibrant colors on your cards! Beautiful cards. Love how the bright colors and white embossed outlines create a batik look on the first one. So very pretty!! Love your bright cheerful watercoloring!! Wow! These are so beautiful. I espeially love the first one. It's such a work of art. Thanks so much for the inspiration. All three are perfect – love the different techniques! Stunning cards, Gayatri. Love the colors. Such beautiful cards!! I especially like the first one. Very pretty cards. My favorite is the first one. All your cards are gorgeous Gayatri! Love them all, thanks for the inspiration!!! All three of your cards are beautiful! Your cards are beautiful. I am especially drawn to the vibrant colors. Appreciate that you prepared three cards and that you used different techniques. Thanks for sharing. So many beautiful watercolors cards! I especially like the blue background on your first one. Wowsers! Those are all stunning! all three cards are fantastic but my favorite is the first…it is simply stunning!! These are all beautiful! Your water coloring skills are amazing! These are all so beautiful! Love them! Breathtaking and stunning…especially your first birthday card. The colors pop and my eye was so drawn to the design. These cards are beautiful. I have not tried emboss resist – but you've made them sooo opretty – I have to try very soon!!! Your watercoloring is absolutely stunning! I love the first card! These are all three gorgeous and stunning. I think I like the first one the most, because of the way you water colored and created the dimension, but they are all great. I like all three cards, but the first one is my favorite. The colors are so vibrant. I like the way you popped up the inner image. I have much to learn. Thanks for a great lesson. Your work is always so inspiring! These cards are little works of art!! What beautiful, vibrant watercolored cards! Love them! Wow 3 gorgeous cards. Thanks and I really like how you did the bold colors and softened with the vellum. Wow…you are amazing at watercolors…and the card designs are amazing! All of your cards are beautiful. Your coloring is outstanding on the flowers. Thanks for sharing. Beautiful cards Gayatri. 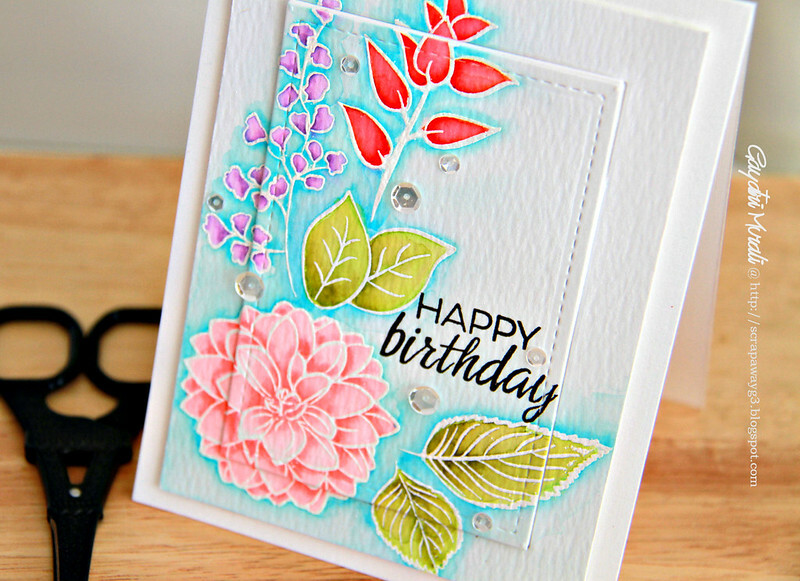 Love the pretty flower images, the white heat embossing… your coloring is amazing. The shading is wonderful. Really what a gorgeous cards. Love the 'bright' colors you used. What gorgeous cards! Love the flowers and the watercolours! I really love the 3rd card-so vivid and bold! I may be in the minority but I loved the first card best. Took me a couple minutes to figure out how you did it and can't wait to try it. Three simply amazing cards! Love the overlapped panels on the first one especially! Your watercoloring is amazing! Three beautiful cards. Beautiful, stunning, lovely cards! The pop ups really add so much to the look of the cards. Wow – you are so amazing!!! Works of ART are what you have created!! Your talents really shine!! Beautiful cards. I love the look of white embossed images with watercolor. Thanks for sharing your beautiful cards. All three cards are beautiful but, for me, the first one is a stunner! I want that stamp set! Wow! You have been busy! I am always in awe of how many cards you make. I love all of them especially since they are all so different. Love all your cards, but I especially love the first one! Wow! These are so gorgeous, you are inspiring! Your colouring is so beautiful! Such stunning cards! I just love all your cards so much, awesome projects! Gayatri– As always, absolutely stunning!! Your cards are absolutely beautiful!!! Wow! prettier and prettier the more I scrolled! The last is my fave! I'm glad someone invited me to this hop! Goodness, you were busy watercoloring! They are all wonderful, but I have to say, the first one takes my breath away! Stunning! Thanks so much for the inspiration! Your cards are stunning! Love all of the colors! I love all the flowers! Fabulous cards! Addie's Garden is on my wish list…. so inspired by your beautiful cards! Your cards are GORGEOUS !! Oh! How I LOVE these!